It's that time of year again — the time of year when you scratch your head, scrunch up your nose, and think futilely about what to buy the travel addict in your life who either a.) doesn't want anything because of his/her minimalist lifestyle, or b.) 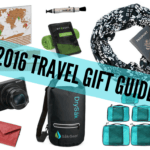 already seems to have everything a travel lover could possibly need or want. I know it's tough. Each year it gets tougher for ME as a traveler to give my family suggestions on what to buy for me; usually I resort to asking for money, or for things I really don't need. To help you out, this year I've come up with a list of a few things that I think any traveler would love to find under the Christmas tree. I've never been a huge fan of backpacks — be they backpacking backpacks, hiking backpacks, school backpacks, or otherwise. There's something so bulky and annoying about them. But I have to take all that back now, because I've finally found my ideal travel backpack. This little day pack isn't very big, but boy does it pack a punch. Not only is the Pacsafe Slingsafe 300 adorable (and available in multiple colors), but it will also help keep your things safe. This water-repellant little backpack is also slashproof, and would be fairly difficult for a pickpocket to get into with its secure zippers and RFID-blocking capabilities. It's not big enough to hold a full-sized laptop, but I've packed my 11-inch Macbook Air, my iPad, and my Kindle into its tech pocket all at once before. It's bigger than you think! >> Buy it on Amazon! Whenever anybody asks me for packing tips, I only ever answer with two words: packing cubes! These meshy zippered compartments are the secret to my packing prowess. 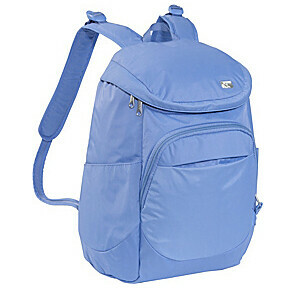 They allow you to organize your things inside a backpack or suitcase without taking up any extra space! I travel with up to 5 of these babies — 2 larges ones (1 for tops, 1 for bottoms), 2 medium ones (1 for underwear, 1 for pajamas/miscellaneous other things), and sometimes 1 long skinny one that I use for socks. It makes it so easy to organize everything, and it saves me from digging through my entire backpack/suitcase for a specific t-shirt or bra. >> Buy some on Amazon! I used to be vehemently against e-readers of any sort. (I like REAL books, damnit; I like to feel the pages and smell the words!) 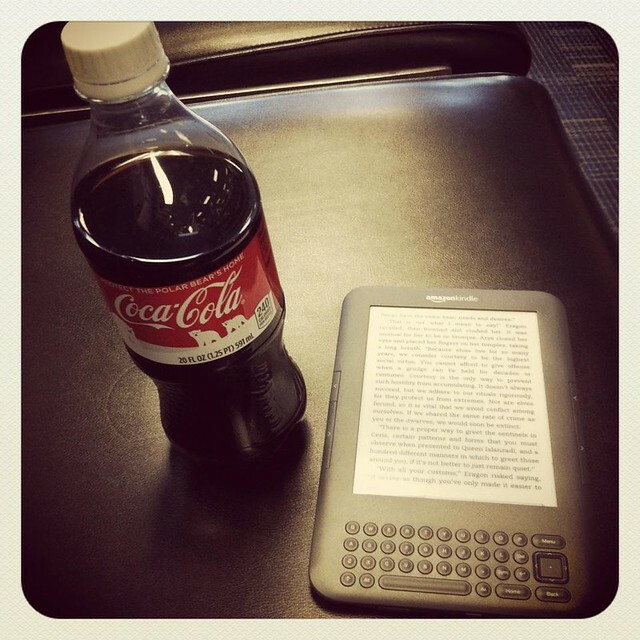 But then I got a Kindle about a year ago, and I became an immediate convert. This little bit of technology weighs next to nothing, takes up hardly any space, and yet can hold thousands of books. These books can often be purchased in electronic format for cheaper than what you'd pay for a paperback, and you can buy them while laying in bed. BONUS. At least once a week, I get a question from a reader about what kind of camera I'm using. The answer? 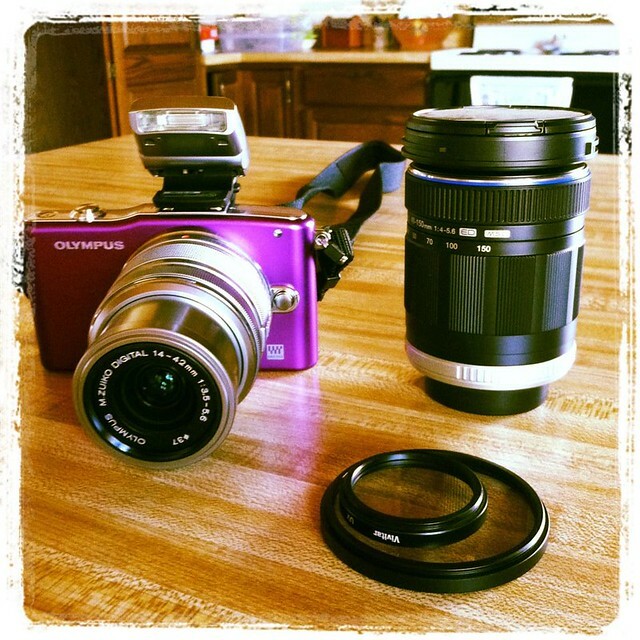 I'm using an amazing little micro 4/3 camera by Olympus — the E-PM1. The smallest (and cheapest) in Olympus' micro 4/3 line, the E-PM1 (AKA the “Pen Mini”) is a big step up from a point-and-shoot camera, and only a little step down from a more professional DSLR. It is small enough to still fit easily into my everyday purse, yet I can swap out lenses like you would on a bigger, bulkier camera. And the best part? It takes fantastic photos for a camera of its size. If your giftee would like to upgrade their camera, this is an option worth considering. Looking for a slightly cheaper gift option? Well, every traveler loves maps! Here are a few map-related items guaranteed to please anyone with a case of wanderlust. A big wall map is such a simple gift — and yet, coupled with some colorful push-pins or gold star stickers, can turn into one of the best gifts you will ever give. I have 2 giant maps at home — 1 of the world, and 1 of the United States. I don't actually own one of these myself since I have those above-mentioned maps. But I LOVE the idea of a scratch-off map to show off where you've been in the world! Who wouldn't want to dream of travel while in the shower or on the toilet?! I bought one of these about 3 years ago, and will never go back to a conventional shower curtain. I got this skin for my iPhone 4 about a year ago, and have not removed it since. Essentially, it comprises of 3 stickers that you put on your phone (1 on the back, 2 on the front). You also get e-mailed the image you can use for your background. (I then also purchased a clear-backed protective case to use over top of the skin.) I can't tell you how many compliments I get on this! Most travelers, at some point in their globe-trotting careers, have used a guidebook. They can actually be useful (I use them myself), but they can also be bulky and impractical to carry along on the road. Thank goodness for the digital age! 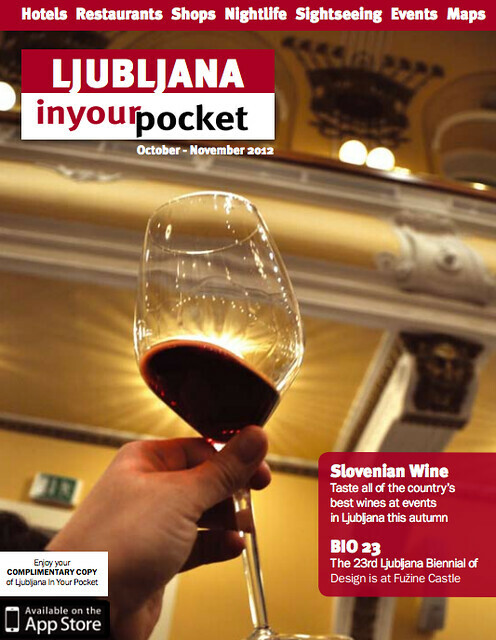 These days, you can purchase guidebooks in PDF format (usually cheaper than a physical copy) and download them right onto your computer. If you have a travel-lover to buy for, why not purchase a few PDF guides, download them onto a USB drive, and slip the drive into your recipient's stocking? Perfect for later uploading to a computer, netbook, or iPad! I could have added loads of other things to this list — things like noise-canceling headphones for those long-haul flights, or a Go Pro camera to capture all those adventurous endeavors. But I didn't because I don't use them myself. Everything on the above list is a personal recommendation from yours truly! Will you be adding any of these items to YOUR travel wish list? 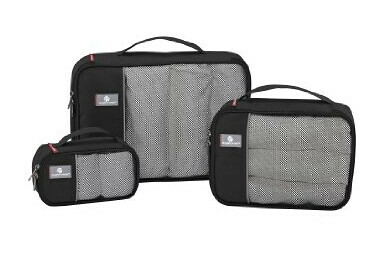 I am DEFINITELY buying those packing cubes for my trip next year – I am such a neat freak they will suit my perfectly! I also have a globe in my room I put stickers on to tick off my places. I like the idea of stickers on a globe! And if you are a neat freak, you absolutely MUST get some packing cubes! You will never go anywhere without them again. Great list! I’m loving my PacSafe backpack! PacSafe makes some great bags! I really love mine, too. I know you have the phone cover, Seattle! I’m pretty sure I first read about it on your blog! Ahhh! 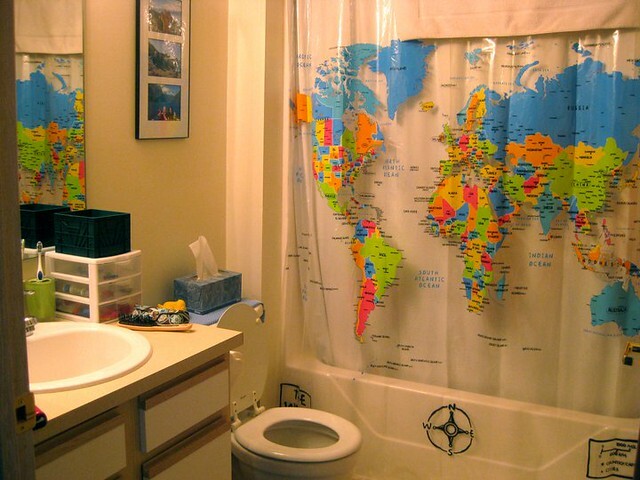 Look at the World map shower curtain!!! I have never thought about this! I am going to get one today. The shower curtain is one of my favorite travel-related purchases! I always get comments on it when new people visit my apartment. Great ideas – I’ve always wanted a scratch away map!! I will have to forward this on to my family. Did you really, Jodi? That’s awesome!! I hope you’re as happy with the camera as I have been! Yep, it’s been a good camera for me. Not too big, not too small and it takes great photos. I’ve been eyeing up those cameras myself, no way am I going to lug an SLR around the world with 2 kids, that one, or similar, may be a great solution. Glad to hear you like it. Now please could you do a list for kids? I have no idea what to get my soon-to-be-nomadic children for Christmas! A micro 4/3 camera could be perfect for you, then! I’d definitely go play around with a couple to see what you think. As for gift ideas for kids… that’s a tough one!! I sadly don’t have any brilliant ideas for little ones! 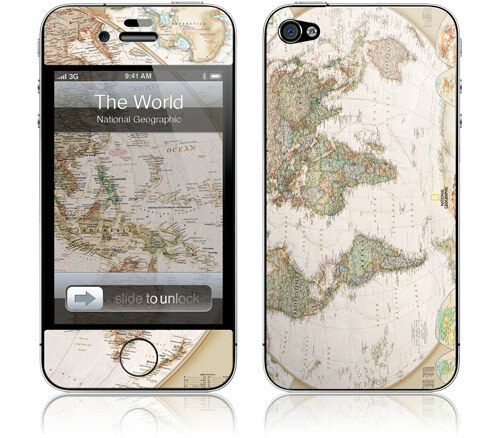 World maps are such simple gifts, but a great idea for any traveler! 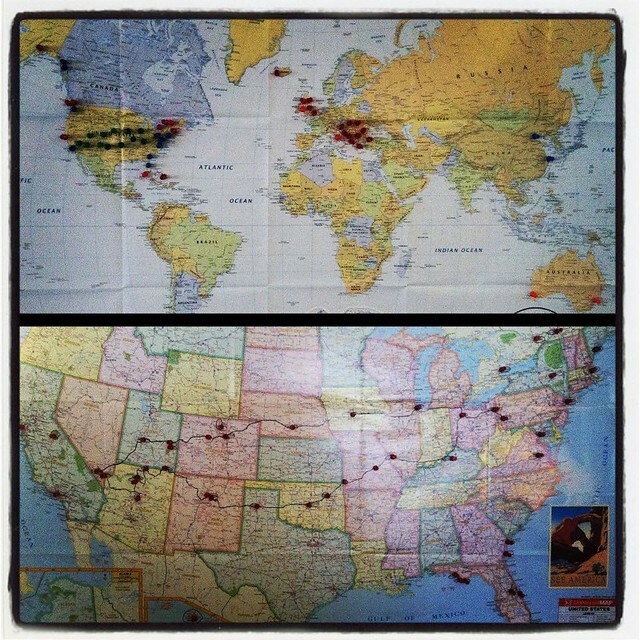 I have one huge world map and another huge USA map in my apartment, both filled with pins. They are always talking points when I have visitors over! I have a shower curtain map at home and I LOVE IT. I spend so much more time in the bathroom now, and I can pinpoint where Djibouti is! Haha, it really is a good way to brush up on your geography, isn’t it?? The scratch-off map is definitely an awesome, creative gift idea for any traveler! And yes, if you want to scratch it all off, I guess you’ll just have to travel LOTS more! I love the iPhone case but sadly I don’t have an iPhone. After a quick I was very pleased to discover that they do iPod skins too, even for older models – this will definitely be going on my Christmas List! Oh cool! I didn’t know about the iPod skins – that would be a great gift idea, too!